I've made a few small changes in the variable names (used "pdf" instead of "pr") and removed the extra use of the probability density functions in Expectation as the pdf's are automatically used when the associated distribution is defined. If one is willing to believe that x1 given x2 has a normal distribution, then one just needs to find the mean and variance of that distribution to be able to construct H12. How can I show a rotated PDF plot superimposed on a ListPlot of the underlying data? Dirichlet marginals - why does Mathematica not give the *Kth* marginal? 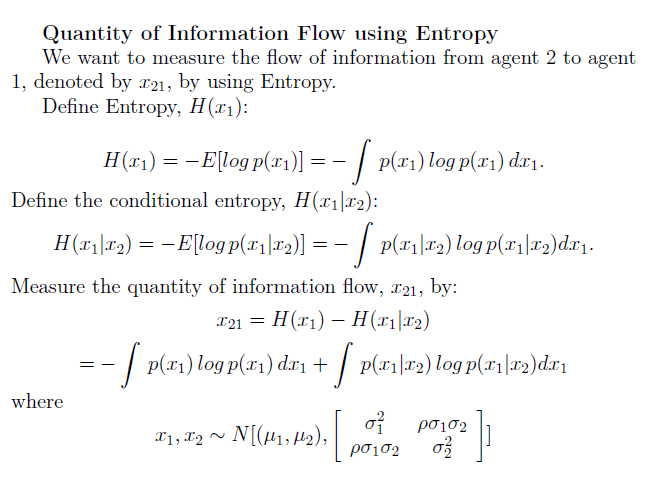 Entropy[…] doesn't calculate the entropy of a probability distribution? What does it do? Why does FindDistribution give nonrepeatable results for fit parameters?